An aurora is an upper atmospheric electrical phenomena, appearing in the night time sky as bright illumination of colourful incandescence radiance. It is mostly viewed nearer the magnetic poles, but can sometimes be seen, from time to time, at lower latitudes. Rarely, they may even at the equator. An aurora can be seen either as some homogenous glow or organised as visual rays of light, which may comprise of differing colours, especially red, green, violet or blue. Southern hemisphere aurorae are termed Aurora Australis, and in the north Aurora Borealis. Often when viewed simultaneously in both hemispheres, and they are collectively termed as Aurora Polaris. As for the general noun, modern usage calls the singular phenomena aurora, with the plural or genitive being aurorae and NEVER auroras. Its adjective form it is referred as auroral. Any appearance of a bright and interesting auroral event can be very unexpected, though knowledge of strong solar activity from satellite or ground based observations, may give some forewarning between twenty-four to thirty-six hours. Most begin as as no more than very faint, colourless unimposing glows, with perhaps small patches of light or just one single ray. This may quickly be followed by a rapid rise — perhaps only within minutes — of an illumination that may cover the entire sky with light. Here it becomes possible to see a quite spectacular evolving multicoloured light showing many different forms or structures. These may removing all the stars for view, perhaps for a short time, perhaps for the entire night. Once this display has literally shocked you into disbelief, it may disappear as rapidly as it came into view. Often you may have to wait considerable time before another bright aurora will show its wondrous display again. In places like southern mainland Australia, you might have to wait several years. Sometimes even one or two decades, before you get the lucky chance to see another. If the event was seen in country skies and you live in the city, you may never see another again. Others in more southern clines may aurorae on average about once per week as a regular occurrence. On this latter point, I have even heard of the aurorae being described as an complete nuisance. For example, mothers complaining that they have to always cover windows with heavily made curtains just to stop some bright auroral event from waking their young children in the middle of the night! Although all aurorae for some stargazersare an emotionally exciting experience, its occurrence is fairly complex, it is today scientifically reasonably well understood. Such astounding eerie light is caused by simply applying an electrical current that collides with normal neutral atoms like oxygen and nitrogen in the upper atmosphere. Ionising energy of this electric current is sufficient to cause these normally low energy ground state atoms to adsorb the energy and become electrically “excited”. Once “activated” the energy is held for a brief moment, then after a short or long delay depending on the atom, reemit visible light at certain discrete wavelengths as single colours. For most aurorae this means they will appears mainly as either green or red. This unusual illuminating process by this seemingly unusual cold ‘electronic chemical reaction’ is properly called fluorescence, and said to have causing atoms to fluoresce. I.e. This emitting light is under the same process that occurs in the everyday fluorescent light tube that you may have in your bathroom or perhaps outdoor for the backyard or shed. Energy is transferred to these upper atmosphere atoms by very fast moving charged solar subatomic particles, like negative electrons, and in lesser numbers, positive protons. These are often expelled by dramatic violent solar storms that are issued by flares or so-called coronal mass ejections (CMD’s. Such events hurl huge amounts of subatomic particles away from the Sun, hurling them across the gulf of space at hundreds to thousands of kilometres per second. If by chance if these flares or CMD’s happen to facing towards the direction of the Earth, the our planet becomes bombarded with these high velocity particles, to collide with the protective magnetosphere of the Earth. Although these particles are travelling at tremendous velocities, they still take a day or two to reach us across the gulf of 150 million kilometres. Most of the solar wind is streaming away nearly equally in all directions away from the solar photosphere, and mostly is feed along the hot million degrees or so corona An average velocity for the solar wind is often quoted as around 700 km.sec-1, calculating out as about 2.8 days. Depending on the space weather, typically velocities can vary between 200 and 800 km.sec-1 Also the average solar wind density is about one ion per cubic centimetre and each have energies of about 1 to 5 keV per particle. During significant CMB events, these energies may increase to up to 10 MeV (ten million electron volts.) At any time, the solar wind speed is available on line at Australian Government’s Bureau of Meteorology Site : Radio and Space Weather Services. However, these solar wind particles are not destroyed but are only entrapped or caught-up within the the magnetic field. Rapidly they interact and then are confined within this magnetic field to become powerful spiralling streams that follow the many field lines. Eventually the field’s general curvature eventually forces them to intersect, where they collide in the upper atmosphere, creating the fluorescent light-producing reactions — seen to our eyes as the visible aurorae. One can think of these field lines being akin to some giant electric generator whose electrical circuitry holds truly awesome power. They generate tens of millions of amperes and anywhere between 40,000 and 55,000 volts. Here is the secret particular natural wonder of the aurorae — an event producing enough power to support the electricity needed for large industrialised nations. It is also something that industry cannot harness or use with our current available technologies. Upon the Earth surface, most of the time the electric current produced is very weak, but when some magnetic storm or disturbance happens — an auroral display is produced, so the current generated becomes much higher. The energies when it does can be sufficiently fierce to disrupt short-wave radio transmissions, radio fadeouts, causing surges in the electrical power grid and sometimes even massive blackouts. Other subtle effects are less noticeable. For example, the air may feel seemingly be full of static electricity, or making crackling or whooshing sounds. Much about the reason why this particular phenomena occurs is not fully understood, but probably relates to the same things heard and felt near electrical motors and other such equipment. Positioning of the Earth’s magnetic poles does not correspond with the rotational axis of the Earth, and hence, varies significantly in geographical latitude and longitude. Geographical positions for all places, regarding the magnetic field, are commonly measured in terms of geomagnetic latitudes. This explains why observer location is important in seeing aurorae. As we have already seen, activity decreases in the southern hemisphere the further north you go. Hence, the Aurora Australis is seen directly south of Australia in the Southern Ocean, but are rarely seen in the South American countries or even on that continent’s far southern tip. In geomagnetic latitude, Sydney lies at geomagnetic latitude 42°S, Melbourne is about 47°S while Hobart and New Zealand’s southern town of Invercargill is at geomagnetic latitude 51°S. As for South America’s southern tip the geomagnetic latitude is presently 20°S — thus not a good place for observing aurorae. A map of the geomagnetic positions can be found at NOAA. True variations are significant across all of Australia, which for example, is −1.6° in Perth and −15° in Hobart. Casey Station in Antarctica has the magnetic deviation of −91.7°, meaning geographic north points to magnetic west! The Australian Government has produced its useful website for determining the magnetic variation based on the geographic location of the observer within Australia, or in fact throughout the world. This can be found at the Geoscience Australia under the webpage Australian Geomagnetic Reference Field Values (AGRF) calculated by the so-called AGRF models. Magnetic Deviation is the variation of the compass from true south at the given location as of the 1st January, 2015. Positive values are towards the Eat, negative to the west. Results are based on the Earth’s magnetic field models, and details about the methods and standards adopted are discussed in some detail within this site. Most locations of magnetic variations have to account for other anomalies. For most purposes, like trekking through the Australian bush, such knowledge may save you getting lost when using a magnetic compass for finding the cardinal directs. In most instances this has been replaced by satellite technology like GPS to locate where you are. At this site are several world maps showing magnetic variation. I.e. For Australia or the Rest of the World. Inclination, or the vertical needle dip, across Australia is Inclination at Epoch 2015.0. More importantly during the appearance of aurorae, compass needles do not work very well. It is not unusual to see the direction erratically or wildly change by many degrees over a short time. This is not the only observed change. We often only think of compasses being affected in the horizontal plane to find the cardinal points (north, south, east and west), but they are also significantly influenced in the vertical plane. If an aurora, say, was to occur overhead, then the field lines intersecting with the surface of the Earth have a tendency of pointing the needle upwardly. When at quieter times of magnetic disturbance, the needle would be far more level. This last effect can be usefully employed to act as some aurorae detector. Here if a device is set-up where contact is made to complete an electronic circuit only when the compass needle rises sufficiently, this can be used to trip an alarm — alerting of some imminent auroral event. All aurora therefore are found within a circular ring about 3,000 kilometres across on the Earth’s surface whose centre is place on either geomagnetic pole. During periods of normal activity this diameter averages about 19° to 20° away from either the north or south magnetic pole. When considered in three-dimensional space. I.e. From the surface to 1000 kilometres up, the aurora will appear to move within the so-called auroral oval. So in reality, the electric current need to produce the aurora is not being pumped into one point but into two separate asymmetric ovals or torus-shaped belts. The real size and shape of the auroral oval varies depending on several different factors. For example, during daylight hours, the oval may shrink to only about 15° in magnetic latitude from the poles. At night these ovals may gradually increase to 22.5°. Yet, this is only a general guideline. During periods of significant solar activity or when there are particles ejections from a solar flare passing the Earth, through coronal holes as CME (Coronal Mass Injections), then the auroral oval can dramatically expand in size and brighten. In some of these instances an aurorae display during violent geomagnetic storms can be seen from much higher magnetic latitudes than normally would be unexpected. This auroral oval is continually photographed from several polar satellites, including one American satellite named POES. Any changes that occur are quickly recorded and made available across the Net. Current oval images can be found at Space Environment Center, and can be searched for recent images, movies and various plots. Due to the varying height, the distance of the aurora from the observer can be considerably far away. This is mostly due to the curvature of the Earth, which an observer standing at sea level is about 5 kilometres. Assuming an object is higher, like a ship’s mast, an observe can see a bit further than this. We know that the base of an auroral display lies about 100 km. above the ground, meaning we can possibly detect a bright aurora when it is less than about 1300km. away. Higher aurorae, can be around 300km. in height, and such events could be seen around 2,300 km. away. From a low latitude location, like say Sydney, we know the central portion of the auroral oval averages in distance about 2,200 km. (and the geomagnetic pole is about 5,500 km. See Figure x.) This means when a rare very bright energetic aurora do appear, they become feasible to see from a lower latitude locations. We know most low latitude aurora tend to most only red coloured event, which are known to be at the highest altitudes, between 300 km., and in some rarer circumstances, can rise to a maximum of 800 km. However, see aurora on the horizon is almost impossible, so we must account for the maximum height the some aurora was seen. If say, the maximum altitude was 15° above the horizon, then the true distance that the aurora appears from us must be closer. As the Kp index becomes about 7 or so, the auroral oval expand slightly by several hundred kilometres, making such an aurora possibly better viewed from low latitude. Not all aurorae are necessarily seen due to just the auroral oval, such that, events can occur outside its boundaries. Under intense CME events, the magnetic field is so battered, that aurorae occur can become visible even as far as the equator, as happened in Singapore in 1903 or during the famous Carrington Event during 3rd September 1858. Table 2 below, shows the height of the aurora and the possible distances they can be seen on the horizon. Auroral displays have been known since ancient times. They were first recorded by Pliny, Seneca and Aristotle in the ancient literature. Most were feared by populations in Europe as evil portents signifying fire and great evil raining down on the world. Some saw them as terrifying events being huge sky battles by dragons, gods or sky spirits. For those living closer to the poles, like the American Indians, Vikings or the Scandinavian peoples their appearance were greatly admired and honoured. They were were certainly use to aurorae appearing regularly, so this became significant parts of their various elaborate folk-laws. “Some people maintain that this light is a reflection of the fire which surrounds the seas of the north and the south; others say that it is the reflection of the sun when it is below the horizon… for my part I think that it is produced by the ice which radiates at night the light which it has absorbed by the day”. Today, one of the most common misconceptions about the aurora were that it was caused by the influence of sunlight — either by being light somehow being reflected by the upper atmosphere or via some other similar physical phenomena. Although is was later shown that some aurorae appeared blue or purplish due sunlight shining on the upper rays during twilight, it was not the principal process of the auroral light. A correct explanation did not begin to be properly described until about 1726, where the geophysical observer, Jean Jacques d’Ortous de Mairan (1678-1771) determined that the aurora occurred around heights of 100 kilometres above the surface of the Earth. This was later calculated in 1784 by the English physicist Lord Henry Cavendish (1731-1810), who found the height lay between 70 and 150 kilometres above the Earth. In modern determinations, the true height of the aurorae can vary between 60 to as high as 1,000 kilometres! Cavendish proved to be correct in his estimations. Heights are indeed typically in the range between 100 to 300 kilometres. By 1872, a comet observer, Giovanni Battista Donati (1826-1873) suggested that the cause of the aurora was closely linked to the Sun, which he concluded after some crude spectroscopy on the auroral light. Another by the name of Eugen Goldstein (1850-1930), who incidentally worked on the original cathode ray tube suggested in 1879 that the auroral rays could be caused by solar storms — explaining the real connection between both the aurorae and observed magnetic storms. This concept was taken seriously by Norwegians, Kristian Birkeland (1867-1917) and Fredrik Carl Størmer (or Störmer) (1874-1957) in 1896, who produced new mathematical models on how these auroral mechanisms worked. One of the first of the Australian amateur astronomers to observe and discuss the aurora was Francis Abbott (1799-1883), who arrived in Tasmania in 1844 as a convict. In 1870, he read a paper to the Royal Society of Tasmania, proving statistically there was direct correlations between sunspot numbers and the auroral frequency. He correctly theorised that the Earth was encompassed by a huge magnetic field, which was first espoused by Edmond Halley (1656-1742), but properly explained independently by English astronomer, Balford Stewart (1828-1887), just eight months before Abbott. Abbott had also stated that auroral appearances were likely related to the planetary magnetic field lines. In the southern hemisphere, the magnetic pole is placed just off the coast of Antarctica facing towards Australia. From latitudes south of about −45°, being roughly from Tasmania to southern New Zealand, will usually see aurorae more frequently than any other populated areas in the southern hemisphere. As the South Island is closer to the magnetic pole, therefore places like Queenstown and Invercargill will see many more aurorae. 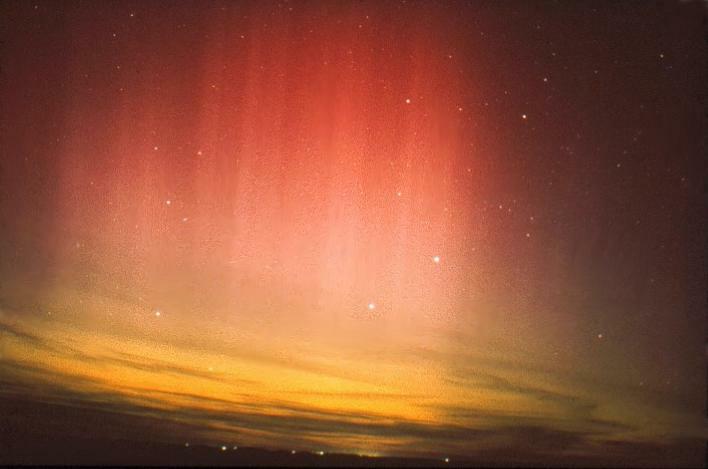 From Australia, the aurorae is mainly seen in its southern parts — namely Tasmania, southern Victoria, and sometimes South Australia and southern Western Australia. Aurorae, though less frequently, has been viewed from latitudes like Sydney, much of New South Wales, and even Brisbane in Queensland. Far more aurorae, however, are visible nearer the Antarctic continent. Macquarie Island, located at &;minus54.5°S, 158.9°E, sees more bright aurorae than any other locations in the southern hemisphere. Generally the stronger the outburst of geomagnetic activity, the further away from the geomagnetic poles that an aurorae can be seen. These powerful events are far more rare, so the frequency of the aurora will decrease rapidly. Overall this frequency does changes significantly. It depends mainly on the proximity we are to solar maximum and when the sunspots are near maximum numbers — and this occurs near Earth’s magnetic poles around latitudes of about 60°N ; namely, Canada and Greenland in the northern hemisphere, Tasmania and New Zealand in the south hemisphere. At the actual magnetic poles, fewer aurorae occur than from the auroral ovals placed some 1,500 kilometres away. In theory, an aurora could be seen anywhere on Earth. It is possible to see aurorae nearer the equator — perhaps possibly as frequently as once or twice each century! Of course, much of this activity is also closely locked-in with the 11.3 year solar sunspot cycle. This explains why more aurorae and more probable nearer, or just after, solar maximum that at minimum. Furthermore, that most aurorae in high geomagnetic latitude will only be seen during solar maximum.